"Providence River Scene, R. I." by Callender Mc. Auslan & Troup Co., Providence, R.I.
Providence River Scene, R. I.
Callender Mc. Auslan & Troup Co., Providence, R.I.
Used. Postmark: (month illegible) 2, 1908. Callender Mc. 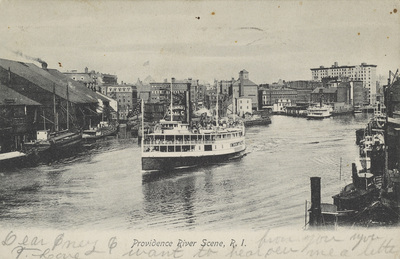 Auslan & Troup Co., Providence, R.I., "Providence River Scene, R. I." (1908). Rhode Island Postcards. 181.